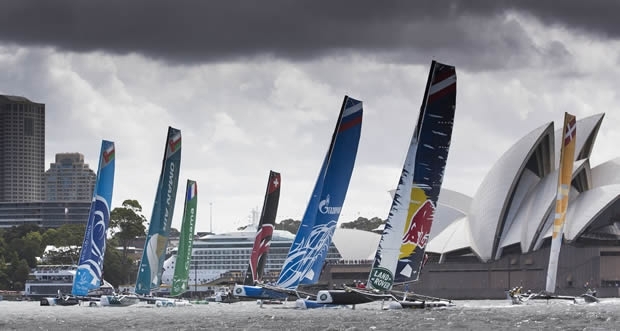 An action-packed day on Sydney Harbour at the Extreme Sailing Series presented by Land Rover saw a grudge match between Alinghi and The Wave, Muscat. Two race wins for the Swiss to the Omanis one, means it’s advantage Alinghi heading into tomorrow’s final day – with their fellow countrymen Realteam in second place and The Wave, Muscat just two points back in third. Softening, but no less testing conditions caused a shuffle on the leaderboard, with five different teams winning today's eight races. J.P. Morgan BAR started the day on the back foot, when Realteam slammed into their back beam during the tight windward mark rounding, knocking out their rudders and the team out of the following three races. A points redress for the team limited the damage ahead of tomorrow’s final day and the Brits are five points ahead of a seemingly revitalised SAP Extreme Sailing Team. The Danes found some of their best form of the season with four second place finishes elevating the team to 4th from 7th place at the beginning of the day. It was also an impressive day by GAC Pindar. There were two race wins for the Nathan Wilmot-skippered crew, but this was not as impressive as his former Australian Olympic team mate Tom Slingsby on Oman Air, who was rarely out of the top three. The Omani team finished the day in seventh place, four points ahead of Phil Robertson and Gazprom Team Russia, which leads GAC Pindar by another four points, with Groupama sailing team languishing in tenth. As the fleet heads into the final day, tonight’s team debriefs will be some of the most important of the season, with points for both Sydney and the Championship at stake. With the Sydney event and the final race worth double points, it will be tight. Will Realteam win their first ever event and secure their place on the 2014 podium? Can the four-times Olympic champion Ben Ainslie and the Brits pull off their best day of the season? Can Alinghi take victory in the 2014 Series, or will Leigh McMillan and The Wave, Muscat ruin their plans?